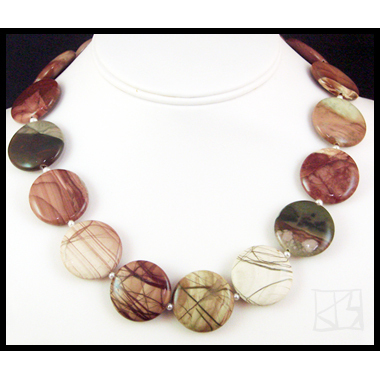 Jasper is the only semi-precious stones found almost everywhere on earth in so many colors and patterns. This is Spiderweb Imperial Jasper, found only in one specific geologic area in Mexico. It is said to assist in revealing one's spiritual being, the transition to one's celestial life; to reduce anxiety and melancholia. 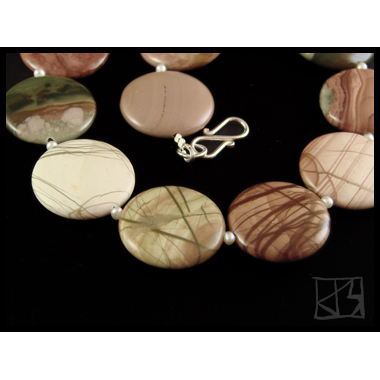 The swirling bands evoke the planets in warm shades of ivory, maroon, rose, tans, brown and greens. The beautifully polished discs are separated by tiny genuine pearls and the necklace concludes with a Bali sterling silver s-hook. A 3-inch sterling extender chain is included. Elegant in shape and style, versatile in color. Simply heavenly!